Mogadishu (HAN) May 9, 2014 – According to the US National Counter Terrorism Center, Al-Shabab’s terrorist activities have mainly focused on targets within Somalia, but it has also proven an ability to carry out deadly strikes in the region, including coordinated suicide bombings and a deadly raid on a Nairobi West gate mall. Western countries and regional security partners fears that Al-shabaab, which has successfully recruited members of the Somali diaspora in Asia, Europe and North America, may orchestrate strikes on international targets. Today In Malaysia, The deputy Inspector-General of Police Datuk Seri Mohd Bakri Zinin said “Members of Al-Shabaab have been entering Malaysia pretending to be private college students and tourists. The Bukit Aman Special Branch Counter Terrorism Unit has been tracking six Al-Shabaab Somalia members who entered the country in the past few weeks, according to sources. They said the group planned to set up a base in Malaysia to hide their members from the authorities. Some of the members had left the country but police were monitoring those still here, the sources said. The Geeska Afrika Online reporte that Al-Shabaab had no links with the militants arrested in Selangor and Kedah recently, according to the Inspector-General of Police Datuk Seri Mohd Bakri Zinin. Police achieved a breakthrough when they arrested a 34-year-old Somalian man, wanted by Interpol for alleged terror links, in Selangor yesterday. “More arrests are expected soon. The police have to act fast before this terrorist group gains a foothold in the country,” one source said. Deputy Inspector-General of Police Datuk Seri Mohd Bakri Zinin said the man, who was detained at about 4pm, was believed to be involved with the Al-Shabaab terrorist faction. “He was previously charged with being involved in terror activities in East Africa and was listed in Interpol’s Red Notice (meaning he is being sought to be extradited to his country of origin). “We are investigating his activities in Malaysia to uncover Al-Shabaab’s network whose members might be hiding or planning action that can threaten the country’s safety,” he said in a statement. 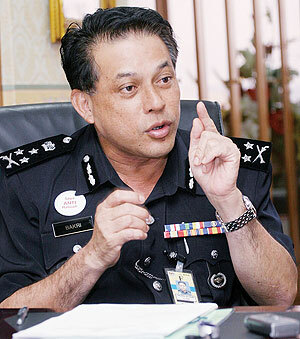 The man is being investigated under the Security Offences (Special Measures) Act 2012. It is learned that police are still searching for a weapon cache the man may have. Despite the group’s defeat by Somali and Ethiopian forces in 2007, Al-Shabaab – which is clan-based – has continued its violent insurgency in southern and central Somalia. The group has exerted temporary and, at times, sustained control over strategic locations in those areas, using guerrilla warfare and terrorist tactics. Next articleSomalia: Aid Agencies have warned in a joint campaign entitled "Risk of relapse"